The middle aged man in the mackintosh, the trilby, pipe and brolly combo, it can only be Monsieur Hulot, the masterful creation of absurdist French comedy genius Jacques Tati. 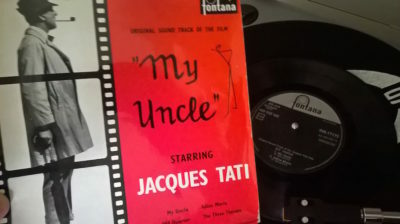 This soundtrack EP for Mon Oncle, his Oscar-winning second film outing as Hulot, perfectly captures the mood of the moment – it sounds slightly passé, at odds with the Now, yet is somehow unmistakably ‘mid-century modern’. Hulot is hopeless at anything current. Technology baffles him, he lacks the skills to deal with it yet is condemned to feign interest and claim mastery. The crisp rhythms and deceptively simple melodies employed in the score are ideally suited to Hulot’s charming small town bungles. This is retro even for 1958 with swinging accordions and tinkling piano motifs augmented by nifty flute swoops and even a banjo on Franck Barcellini’s title theme, but then a muted vibraphone suggests at least something of the modern world. Flute and banjo drive Alain Romans’s Adieu Mario with dashes of trumpet before the muted vibe returns on Side 2 in Barcellini’s The Old Quarter. A medley of all three themes brings the set to a close.